Since the San Antonio Spurs drafted Tim Duncan with the first overall pick in the 1997 NBA Draft, they have led somewhat of a charmed existence. Six finals appearances and five championships later and their president of basketball operations and head coach Gregg Popovich has overseen one of the most sustained periods of excellence in all of sports. Even when Tim Duncan retired after the 2015-2016 season, the Spurs’ future looked very bright. And with a 61 win season and a trip to the Western Conference Finals in their first year without Duncan, the Spurs looked poised to continue this extended run of success for the foreseeable future. It almost seemed like 20 years of success and good karma hit a brick wall because of a sloppy close out on Spurs star Kawhi Leonard by Golden State Warriors center Zaza Pachulia early in the 2nd half of game 1 of the 2017 Western Conference Finals. The Spurs were left with what could have been and hopes to be able to challenge the Warriors the following season with a healthy superstar, but some cracks in their foundation were starting to shine through. At this stage, Kawhi Leonard’s dissatisfaction with the Spurs and his trade request are well documented. As is the fact that the Spurs were able to trade him to the Toronto Raptors along with Danny Green for DeMar DeRozan, Jacob Poeltl, and a top 20 protected 2019 1st round pick. However, even before that, there were some signs that the gold standard of NBA franchises was not adjusting as a unit to a new breed of NBA player. The first sign was the reported ongoing unhappiness of LaMarcus Aldridge. Now, it’s important to note, Popovich made it work with Aldridge and got his signature on a 3 year $72 million contract extension. Nonetheless, star unhappiness was not a familiar predicament for the Spurs, at least not at that stage. One of the other small signs that the Spurs were not necessarily the Spurs anymore is the story of Jonathan Simmons. Simmons paid $150 for a D League tryout in 2013 with the Spurs G-League affiliate in Austin, Texas. He ended up making his NBA debut on November 14, 2015. It’s a sentimental story at its surface, but when it came contract time for Simmons in the summer of 2017, the Spurs were not sentimental at all. As a matter of fact, one could argue that they were too practical. During the 2017 playoffs, Simmons had proven himself to be the type of athletic wing that can make life hard on some of the best perimeter players in the league, specifically James Harden, who he did a superb job guarding in the 2nd round of the 2017 playoffs. The Spurs had no way to know last summer that Leonard would only play nine games this season. However, there are other important considerations at the time they chose to let Simmons go sign in Orlando. They knew that two vital parts of their wing rotation, Danny Green and Manu Ginobili were both aging. Ginobili slowing down is part of playing at 40 but the writing has been on the wall with Green for a few years as well. The other important consideration that the Spurs chose to ignore was that Simmons was Leonard’s best friend on the team. Speaking of Leonard, this is the spot where the Spurs have veered off their path and broke some extremely important rules regarding how they operate as a franchise. It has been well documented that Leonard believes that the Spurs misdiagnosed his quad tendon problem. Leonard getting a second opinion was far from an unusual step to take considering that he felt he had been misdiagnosed. Nonetheless, it was reported by Adrian Wojnarowski of ESPN that there have been issues between the Spurs and Leonard since January. The Spurs have built a culture where two of the more important pillars have been for all members of the organization are to deflect credit and accept blame. They also have made it a hallmark of their culture to keep all of their dirty laundry in house. Violating those two philosophies is what made this Leonard situation spiral out of control. Although this may seem like a stretch based upon what Popovich actually said, to understand why this term bothered Leonard so much is to understand who Leonard keeps close to him on both his business and personal matters. What Popovich called Kawhi’s group is really Kawhi’s family. He’s extremely close with both his mother and his sister. Yet, those weren’t the members of his family that appear to be the source of Popovich and the Spurs’ frustration. That distinction belongs to Kawhi’s uncle, his mom Kim’s brother, Dennis Robertson. Leonard was 16 years old when his father, Mark Leonard was shot and killed at a car wash in Compton in 2008. Kawhi turned inward when his Dad passed away and made basketball his mission. He had always had a good relationship with his Uncle Dennis. However, when Kawhi’s Dad was killed, Dennis took a larger role in Kawhi’s life. He became a father figure to Kawhi. They are an extremely close family. They look out for one another and they consult one another on important decisions. But, more importantly, they trust each other well beyond anyone else. And in light of how young Leonard was when his Dad died in such an abrupt violent fashion, trust is a major issue to him and is at the core of his issues with the Spurs. Robertson has been portrayed in the media and on social media as a power hungry AAU Dad looking for his 15 minutes of fame. That couldn’t be further from the truth. Robertson is a 25 year veteran of the banking industry. He spent 20 of those years in a management role on the retail side of a major money center bank. Robertson is not a neophyte in the business world and would not have lasted and succeeded in the banking industry if he didn’t have good people skills. Kawhi leans heavily on him for advice. More importantly, Robertson has been with Kawhi from day one. The night Kawhi was drafted, Dennis was right there with him and Kim in the green room. He’s not a fly by night relative who swooped in when Kawhi became a top 5 player with thoughts of cashing in, as so many have implied. The widely spread notion that was spawned through the local media in San Antonio is that Robertson has ‘poisoned’ the Spurs relationship with Leonard. According to sources close to Leonard, he sees it as the Spurs poisoned that relationship themselves. According to sources close to Leonard, the decision to ask for a trade with the Los Angeles Lakers as his desired destination is a decision that was made solely by Leonard. His family actually favored the concept of Kawhi staying in one place for the balance of his career. They were prepared for Robertson to absorb the blame in the public forum but all of them, especially Robertson, are on board because playing in Los Angeles for the Lakers is what will make Kawhi happy. Furthermore, it must be insulting to Leonard that Spurs management and others close to the team have spun a narrative that Leonard is somehow getting bad advice and at the age of 27, isn’t capable of making a career decision on his own. They grossly miscalculated Leonard’s will and mental toughness. They mistook his quiet demeanor for a malleable sense of weakness that allows him to be manipulated. The Spurs were eligible to offer Leonard a super max extension that would land somewhere in the neighborhood of $219 million for 5 years. For some players, this might heal a lot of wounds but Leonard is a different kind of guy. He’s not a spender. Up until a few years ago, Leonard still drove the same car he drove in college. Those close to him describe him as a guy who still has his first dime. The 4 year $150 million contract the Lakers could offer him next summer will satisfy him just fine. ESPN’s Michael C Wright recently joined The Back to Back Podcast with Tom Haberstroh and told a story about Leonard hiding from Spurs officials who flew to New York to watch Leonard workout. The fact that the Spurs sent representatives perhaps created an issue. Leonard was rehabbing in New York and felt as though he had earned the benefit of the doubt with the Spurs front office. Instead, they sent representatives to watch him making him feel like they wanted to pressure him to come back in spite of what his New York doctor said. As the 2014 Finals MVP and two time NBA Defensive Player of the Year, Leonard felt like he had earned more trust than the Spurs were giving him. Before Leonard got hurt, he was empirically one of the five best players in the NBA. According to league sources, when Popovich and Leonard met in June in Southern California, Leonard told Popovich that he did not want to return to San Antonio. The meeting did not last longer than 10 minutes. 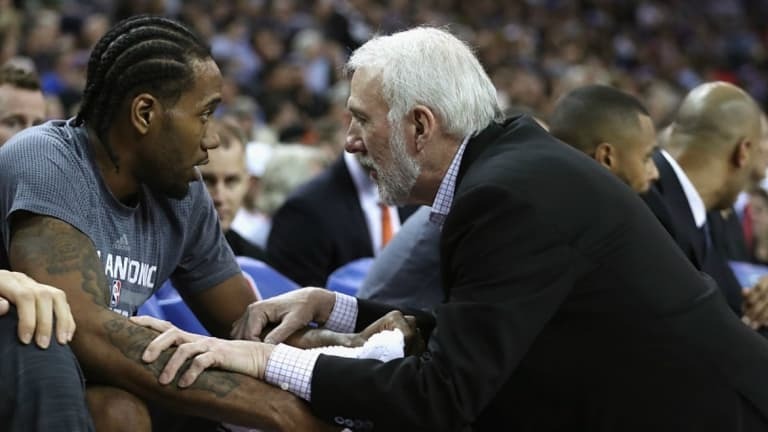 Furthermore, when Popovich requested this meeting with Leonard, he didn’t think to ask for Kawhi’s family or his agent, Mitch Frankel, to be included. In a relationship where trust is the core problem, asking Kawhi’s most trusted family members to join the meeting could have sent the message that the Spurs were not scapegoating them for these problems. That never happened. After this meeting, a few Spurs legends spoke out in the media being critical of Leonard. On June 21, Spurs legend David Robinson told ESPN that this is about “growing up” for Kawhi and that he shouldn’t let people talk for him. Bruce Bowen was even harsher with Leonard on June 22, telling Justin Termine and Eddie Johnson at Sirius XM NBA Radio that Leonard is getting bad advice and not leading well by not talking publicly. He also accused Leonard of not being “fully vested” with the team. The Spurs have had a magnificent 20 year run doing business a particular way. Tim Duncan was as unassuming and selfless as a superstar could ever be while still leading effectively. Kawhi Leonard is not Tim Duncan. He’s even quieter than Duncan and leads through the example he sets with his work ethic and intensity. This is always who Leonard has been. This situation would never have gotten to this point if the Spurs hadn’t forgotten who Leonard was and expected him to be someone he wasn’t. Whatever road this takes, Leonard will ultimately find his way to the Los Angeles because that’s where he wants to be. And his exit to Toronto ended one of the greatest sustained runs of excellence in sports history but the question will linger, did it have to end this soon. DeRozan, Poeltl, and a heavily protected first round pick don’t put the Spurs in a class with Golden State and Houston. The Spurs have changed and an era has ended.